Deadline to send in materials for the October issue is August 15! When will I get the August issue? The August issue is currently printing and mailing. Most churches’ HTH should arrive between August 15 and September 15. Dated materials will be given priority. What events go in the October issue? October 7 and December 15 should go in the October issue. 400+ Studies! We have received 18 requests for Bible studies connected to the last issue of HTH, bringing the year-to-date studies to 477. One of these requests came in for a Bible Correspondence Course. She put in the comments line: “My hair stylist gets the House to House Heart to Heart newsletter and she shared it with me. It’s awesome and inspiring, full of golden heavenly nuggets!” Please pray for these requests to bear fruit for the Master. Another Conversion, Another Gospel Preacher: We have learned of a second man who is now preaching full-time after being converted by a congregation that sent him House to House. Kelli Sewell talked to Oakley Tharp with the Huntsville church in French Camp, Mississippi. He told her that several years ago their House to House was received by a young man who came to visit, learned what the Bible taught, and he believed and washed his sins away in baptism. The church later supported this young man as he attended Magnolia Bible College. He is now preaching for a church in Austin, Texas. One newsletter, one tender heart, and one Bible college student who continues to preach the gospel to many others. Let that sink in! Conversion in Cleburne, Texas: The Granbury Street church of Christ in Cleburne, Texas, posted a video to Facebook (https://www.facebook.com/granburystreetchurchofchrist/videos/1849865648389061/) of Susana Torres being baptized. They added: “Today we welcome Susana Torres to the family of God! Through a combination of House to House Heart to Heart and studying Back to the Bible with Sid and Sherry Carruth, Susana put her Lord on in baptism to be forgiven of her sins.” Such great news! Conversion in Wartburg, Tennessee: Doug Tooley wrote us and said, "Had a fellow obey the gospel Sunday. A while back he sent in one of the quizzes from House To House and requested some tracts. I sent the tracts and our brochure with a hand written note inviting him to church. Those things got him in the doors." Visitors in Airway Heights, Washington: Patrick Newbill is the evangelist for the Westside Church of Christ in Airway Heights, Washington. He emailed us to say, "I had a lady call me yesterday saying she and her husband want to come and visit us this Sunday because the church they are attending is to far for them to travel. So they got the House to House in the mail these last few days and they really like the article and cover with our address. She called just to make sure how to get there. So pray for her." Visitors in Fort Payne, Alabama: The Fort Payne Church of Christ in Fort Payne, Alabama has been covering 10,000 homes with House to House for years, but they still get new visitors from the community all the time. Their preacher, Jimmy Holland, recently let us know that they had four new families visit after their last issue was mailed out. 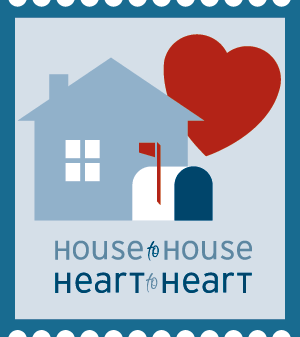 HOUSE TO HOUSE HEART TO HEART IS NOW A MONTHLY PUBLICATION! FINISH 2018 STRONG AND SEND THE FINAL FOUR ISSUES INTO YOUR COMMUNITY! NOVEMBER • Is Christianity the Problem? Your congregation can now do twelve issues of House to House a year! The program is flexible, so you can do anything from once a month to once a year. We will even provide a free website for your congregation. To get started just visit get.housetohouse.com, e-mail us atHTH@housetohouse.com, or call 1.877.338.3397. 3.3 million copies of the July issue (our largest issue ever) are printing and mailing now. Send the final four issues of 2018 into your community!